Blogs may serve any of a number of purposes, ranging from the outpouring of an individual's deepest feelings, to being a platform for political opinions that the blogger may be afraid to voice in person. Blogs can also serve as a means for a company to get news of its product or service out to its customers. 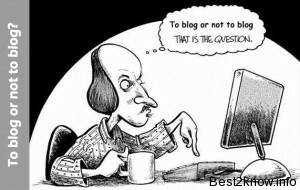 Whatever the reason for writing, certain basic elements of blogging have remained constant. Many of the necessary ingredients for a successful blog are the same as when blogging first became popular in the late 1990s. The first choice the new blogger has to make is whether to go with a blog hosted by a blog-host or whether to pay for their own hosting and install their own blogging software. The hosted option is good for beginners, but not so good for established blogs. According to onblastblog.com, getting a hosted blog with a provider such as Google's Blogger means that the blogger can trust in a reliable, stable blog platform that will stand up to lots of traffic. It also means that they have somewhat less control over the appearance and features of their blog. They are limited to adding only to the tools and plug-ins that Blogger allows, which while sufficient for most may not be flexlible enough some for some high traffic, specialized blogs. The serious blogger may want to move to their own hosting, for which they will probably have to pay. Many hosting services allow users to easily install the blogging software of their choice from a start-page or "dashboard". The first key for any blog on any topic is to write well. There is enough bad writing on the Internet that anything well-written will stand out so that bloggers can often get readers to return purely on the basis of solid, readable prose. The next key element of blogging success is to optimize the blog for search engines. This means using keywords and tools to make it visible so that posts will be indexed and rank near the top in search engine results. Bloggers should note that search engine optimization is a specialized field in itself and will take much trial and error to master. A word of warning: If a blogger is not careful they can get bogged down in studying it and neglect their writing. Still another way to generate traffic is to use social media. This means using sites like Facebook and Stumbleupon. When it comes to Facebook, the blogger may even want to give their blog its own page, this makes it searchable on Facebook and makes new posts easy to share. While most established blogging software and blog hosts have commenting systems attached, a popular blog may want to start its own community, and for that there are hosted forum services like Disqus available. Monitoring traffic is a breeze with WordPress as bloggers have many statistics plug-ins from which to choose that are usually easy to configure and can provide real-time stats on their visitors. An alternative to these would be Google Analytics, which is also easy to install and which may be monitored from the blogger's smartphone or even via a browser extension. Bio: Lenore Maxwell is an active blogger who, aside from running various niche blogs, has also written extensively on blogging. Over the last 10 years she has run over 20 blogs and written several thousand blog posts, both on her own websites and as a guest writer for other blogs including Degree Jungle.